Is the Olympus OM-D E-M5 good enough to be my camera system for personal / family photography? I have a Canon S100 point and shoot camera that I use when I need to be able to put my camera in my pant pocket, but the quality of the images, even at its base 80 ISO, just aren't that good. My professional DSLRs, Nikon D4, Nikon D800E, and the Nikon D3S are the best cameras on the planet, but they are heavy and cumbersome when on vacation or when I'm taking a few photos for personal use at Christmas or birthday party. So I decided to test my OMD on the streets of Washington, DC. I don't consider myself a "Street Photographer,", but I thought I would take my Olympus OM-D E-M5 out for a test drive. So I took the Metro down to around the Tidal Basin where I thought the tourists, hoping to see the Cherry Blossoms, would be out in force. The Cherry Blossoms are late this year because of the cold weather, so there weren't as many tourists as normal, but there still was quite a few. I wasn't quite sure what I was going to take pictures of. The first thing you notice is the tourists are taking photos with iPhones, point and shoot camera, SLRs, and a surprising number of people using iPads as their primary camera. Family members stand there all proud as they get their photo taken in front of the monuments. I started at the Jefferson Memorial and walked around to the Martin Luther King Jr. memorial. I then walked over to the Washington Monument (which is being repaired) and then over to the White House. I used two lenses, the Panasonic 25MM F1.4, and the Panasonic 100MM-300MM. I typically shoot with wide-angle lenses, but I wanted to change it up and shoot with a long telephoto lens. The 100-300 becomes a 200-600 (35MM equivalent lens) on the OMD. I found myself having to constantly back up vs. getting closer as I normally do with my wide-angle lenses. I found the 100-300 to be surprisingly sharp. I had one strange thing happen that I am not sure is a result of the lens or the OMD Sensor. 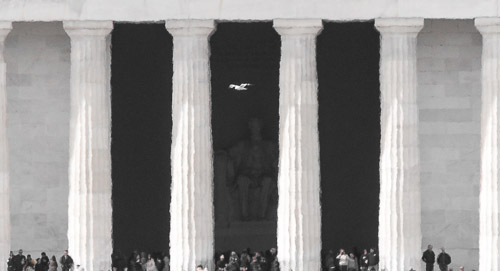 If you look at the columns of the Lincoln Memorial you can see how jagged they are. I shot JPG + RAW and they were both the same (I was thinking maybe that Lightroom was having a problem decoding the RAW). This was shot at about 188MM. Other than that, the Olympus and my two Panasonic lenses performed well. Almost all of the photographs were shot at the camera's base ISO of 200, so I didn't stress the low ISO capabilities of this camera, expect for a few shots in the Metro which were shot at ISO 4000. The lightness of the Olympus OM-D is so nice. I walked about four miles over a three hour period and the camera and lenses were barley noticeable. So is the excellent image quality that comes from a DSLR like my Nikon D800E and the associated size and weight worth the bother for personal use vs. taking something like the Olympus OMD which is super light and convenient. If I want to put the camera in my coat pocket (not pants) I can put my Panasonic 14MM F2.5 pancake lens on my OMD. It is a bit bulky, but it fits. Try that with a DSLR. The lenses that are being developed by Panasonic and Olympus for the Micro Four Thirds platform is very impressive. THE VERDICT: We are planning a family vacation to Seattle this summer. There should be some great photo opportunities. I have decided to take my OMD and leave the Nikon DSLRs at home. It is funny that I don't even notice the weight and size of my Nikon D4 with lenses like the Nikon 70-200 F2.8 when I am on the job as a professional photographer, but when I am on vacation or taking photos for personal use, it makes a big difference. Don't get me wrong, the OMD is no match for the Nikon D4 or D800E for image quality, autofocus speed and accuracy, and dynamic range, but for personal use it is close enough. I am a big believer that as a professional photographer I should be using the best equipment money can buy to deliver to my clients the best quality images. For personal use, I am the customer and I choose to compromise quality for convenience.